North America Forum»Forum ›Magerealm ›General Discussion › The new server Titles ! The new server Titles ! Hello i have one question ! The titles(Unrivaled,Ustopable..) will be during forever ? 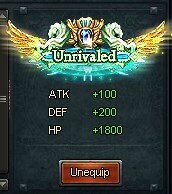 I get this in last day.. this is mine forever? 2019-4-21 11:03 GMT+8 , Processed in 0.072511 second(s), 36 queries .